This medical museum is small but packed with gruesome goodies. It’s tucked inside the The Royal College of Surgeons in Lincoln’s Inn Fields in Holborn. 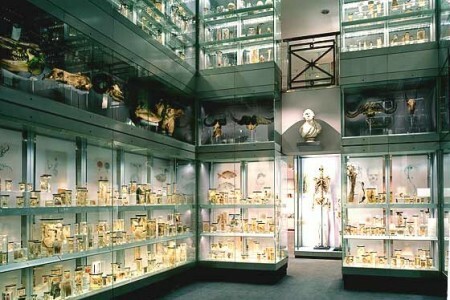 It houses the collection of the surgeon and anatomist John Hunter (1728-1793) but also has exhibitions, The latest displays the remains of prehistoric giants, like the woolly mammoth, the immense Megalodon shark and creatures lost only a few decades ago, including the Tasmanian tiger. This museum is just one you can explore by taking a walk along Museum Mile, which gives an insight into London past and present. Discover 11 of the city’s less-travelled museums and galleries, plus the British Museum, and their diverse collections here.